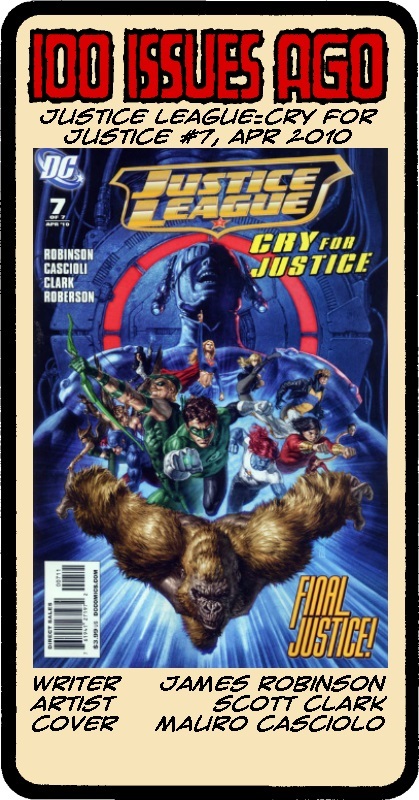 Sadly, I was reading this, the final issue of Justice League: Cry For Justice. James Robinson rightly won much acclaim for his run on Starman where the stories of Jack Knight, his family and friends and even his enemies were told with rare heart and feeling. Some time later, he wrote this which featured Red Arrow getting his arm ripped off, the casual off-screen slaying of most of the Global Guardians and the death of Lian Harper, Red Arrow’s daughter, amidst the destruction of Star City. Posted on Wednesday, August 8, 2018 Tuesday, August 7, 2018 by GaryPosted in UncategorizedTagged 100 Issues Ago, Global Guardians, Lian Harper, Red Arrow. Oh it was, it really, really was. I’m not sure how much of all those unnecessary deaths was Robinson and what was editorially mandated, if any, but yeah, definitely not his best work. If anything, it really cost him a good bit of that goodwill with readers he gained from Starman. These days his legacy is writing books that quickly get cancelled, like FF and Invaders. Yeah, it was a while before I really enjoyed anything by him again after this. Ever since Starman ended I’ve lost any interest in his work myself. Still love Golden Age though. Golden Age was great – I think it was the first thing I ever read by him. I want to say the same, but it was more than likely an issue, either 1 or 0, of his Starman series for me. Oh yeah, Cry for Justice. That was a thing that I would like to forget existed. My pull list was going through some major flux. I had just added the Steph Brown Batgirl series either in April or March, alongside Secret Six and Power Girl (although Conner, Palmiotti and Grey were leaving that book in a month, replaced by Judd Winick). At Marvel, April was the last month for Abnett and Lanning’s Guardians of the Galaxy and Nova runs, although the Thanos Imperative event would kick off the next month. I was going to drop Daniel Way’s Deadpool in a couple of months. This was still during the time where Amazing Spider-Man had different creative teams doing each story, so it looks like I was actually buying a couple of those (a Roger Stern/Lee Weeks Juggernaut story, and later a Zeb Wells/Chris Bachalo Lizard story). And there was an Avengers vs. Agents of Atlas mini-series wrapping up. That looks like that’s about it. Hey, Calvin – good to see you around again. Ah, Power Girl – I loved those 12 issues and was so disappointed at the thought of Winick taking it over. As it was, from memory, it wasn’t too bad under him, but I think the last couple of issues were by Matthew Sturges who would have been great with her ongoing, if not for the advent of the New 52. Most everything else for me from DC at this point was a Blackest Night tie-in.